Below you’ll find answers to the questions we get asked the most about our laser dispersing devices. 1. How do Agrilaser® products work? Birds perceive the system’s approaching laser beam as a physical danger and disperse to seek safety. In contrast to conventional deterrence methods, birds will not become accustomed to the Agrilaser products. They will consider the area as unsafe and will not return. Agrilaser products don’t detect the birds. They work preventively not reactively. 2. What are the benefits of Agrilaser® products compared to other bird control methods? Steering of birds with the laser beam. 3. Which bird species react to the laser beam? 4. Do birds get accustomed to Agrilaser® products? Since the laser beam of Agrilaser products is a dynamic ‘threat’ that is approaching from different angles at random moments, birds do not get used to it and show immediate response by flying away. After repeated experiences with Agrilaser products, birds tend to avoid the area where the laser is active. 5. Are Agrilaser® products also effective during the day? Agrilaser products are also effective during daytime. 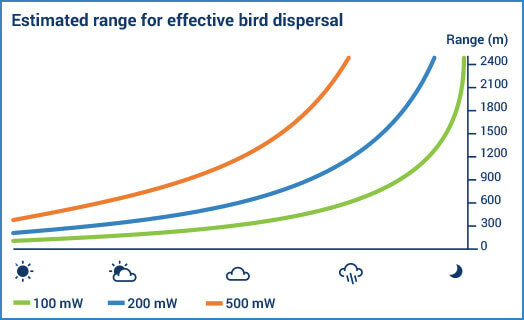 The range for effective bird dispersal depends on the amount of contrast between the projected laser dot and the projection surface. Agrilaser products offer models with different output power to meet the required specifications. A higher laser output power balances out the loss of contrast when the laser beam is spread over a larger surface area. We recommend our most powerful products for daylight use. 6. What is the range of dispersing birds with Agrilaser® products? The range of effective bird dispersal depends on multiple local factors. A higher laser output power is recommended for use during bright light conditions. A higher laser output power balances out the loss of contrast due to spreading of the laser beam over a larger surface area. A higher laser output power is recommended for use in an environment with light absorbing surfaces. To ensure Agrilaser products meet the local criteria customers can choose from 3 models with a different laser output power. Choosing the right model is essential in order to generate a laser projection with sufficient contrast for effective bird dispersal. Frequency of exposure is also important. 7. Are Agrilaser® products safe to use? Yes, all Agrilaser products can be used safely as long as the operator complies fully with the provided safety instructions and follow local regulations. Safety is a top priority at Bird Control Group. All of our products comply with the highest safety standards for laser equipment and we continuously review our Agrilaser line for potential safety enhancements. 8. What laser class do Agrilaser® products have? The laser class depends on the amount of energy transported within the laser beam (laser power) and the wavelength (color) of the laser beam. The unique combination of laser source and optics generate a laser beam that is classified as laser class 3B. The output power varies per product and lies between 5 and 499 mW (milliWatts). Laser classification is based on the laser’s potential for causing injuries. Class 3B lasers can be hazardous for the human eye when exposed directly and for an extended period. Agrilaser products can be deployed safely when used according to the User Manual. Agrilaser products have an expanded beam which ensure that only a small percentage of the laser’s potential can enter the eye. Of course, our products are only for professional use. 9. Why is the color of the laser green? Bird perceive the green laser light best and therefore the bird dispersal is most effective. 10. Could you use Agrilaser products during nesting season? Bird Control Group advises not to use the Agrilaser products during the nesting season. Also, local regulations can prohibit the use of the laser during this period. The Agrilaser should be used as a preventive tool for keeping birds away. If birds are already nesting, dispersing them is very difficult with any method. We recommend using the Agrlaser products at least 1 – 2 months before the nesting season to have the maximum effect. 11. Can you project the laser beam towards airplanes? Always try to avoid projecting towards the open sky. Some of our products are equipped with the patented safety features (Horizon Safety System and Projection Safety System) which prevent uncontrolled projection to aircrafts or at areas with human activity. 12. Can you give 100 % guarantee on the effect of Agrilaser products? No, we cannot give a 100 % guarantee on the effect. In most situations, there is a reduction in bird number between 70 % and 100 % depending on the location and situation according to our research. Check out these user stories for a reference. 13. Are Agrilaser products compliant to European regulations? All Agrilaser products are compliant to EN-IEC 60825-1, European laser safety regulations. Whenever you purchase an Agrilaser product you can ask for prove of certifications. 14. How does the laser work during fog or rain? During fog and rain the laser will be more visible, water drops cause diffusion of the light resulting in a visible laser beam.